Bringing up Charlie: Is it worth going to university? It's A level results day; cue pictures of pretty girls (plus the odd boy) jumping in the air holding bits of paper, if only in the Daily Mail. There'll undoubtedly be headlines about grade inflation too (again, in the Daily Mail) but behind the annual silly season brouhaha some serious questions remain. Higher education (which basically means university or degree-level learning) has grown out of all proportion. 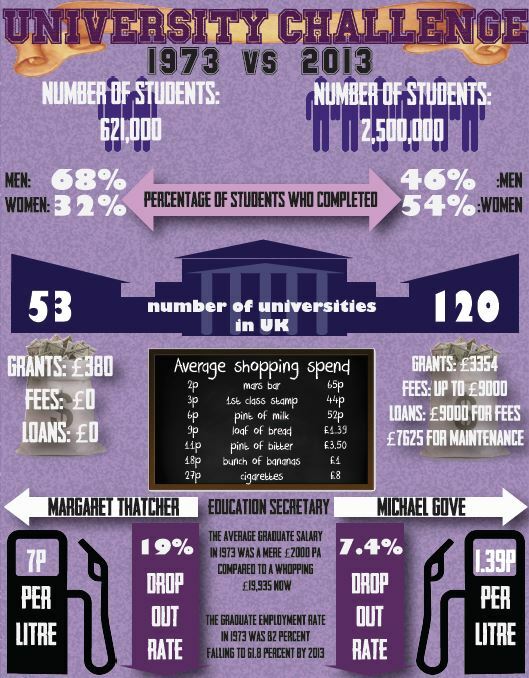 Forty years ago a mere 620,000 people went to uni, compared to two-and-a-half million today. And in 1973 a grant of nearly £400 would keep most students in the manner to which they would soon become accustomed, the more so as fees (paid by students themselves, that is) were zero. Better grades, more graduates, greater debt - these are the known quantities of higher ed. expansion. What seems less certain is whether a degree is 'worth it' economically speaking. Of course there's a persuasive argument that three years of higher education plus a graduate qualification are valuable enough in themselves. But when today's graduates rack up approximately £50,000 of debt in the process the question of worth is at least eye catching. If not eye-watering! Research suggests that graduates can expect to add up to £100,000 to their earnings over the course of their career. That makes the maths a little simpler. But it also assumes there's a career - a graduate career - for every graduate and the number of my former students who return from three years at university to live at home doing a variety of low-paid jobs whilst desperately trying to get their 'career' started seems to suggest that there might not be enough jobs to go around. So is it worth it? As someone who's convinced in the value of education for its own sake, I'd say 'of course.' But is it a worthwhile investment? Well, the figures might suggest you stand a chance of doubling your investment if you're lucky. But that - and just about everything else we'll read and hear about student finance - assumes the benefits of a graduate education accrue to the students themselves, and no one else. Someone else benefits from training large numbers of people to take highly skilled jobs (if they can find them) and pay taxes on higher-than-average incomes, don't they everyone? Yes, Mr Cameron. And Mr Gove. And Mr Clegg. And the rest of us, too. Those students getting their results today and in many cases embarking on the next exciting step of their education are, of course, doing it for themselves. But without them, and millions more like them, we'd be a pretty poor state as a country. So whatever your views of graduate debt or tuition fees or grade inflation, wish those students luck today. We need them! Hmm..lots of things to say. First, I believe that UK degrees will become more vocational and practical when people start questioning whether or not to spend the money. In our day you could fart around doing pretty much whatever you wanted, safe in the knowledge that there were "graduate career paths" and the employers didn't really care what your subject was "as long as you could study to degree level". In reality, yes we might have been brainy, but we still knew nowt when we graduated and had to be trained by our employers anyway. In the US, degrees have never been "free" so a lot of students make sure they get value for money when they (or their parents) pay their fees. The other thing that happens over here is that because uni's have been fund-raising for decades and more, they often have large endowment funds meaning that they can give financial aid to a lot of students. I think that will also start happening in the UK, but not for a while.